This is my inaugural Carnival of Journalism post; this month’s topic is “failure” — professional or personal. I chose personal but the lessons are, I believe, universal. The Carnival of Journalism is a collection of folks who think about journalism and who periodically post a reflection on a given subject. Learn how to join us. Added: Dave posts a round-up. My Ducati was less than two months old, I had been riding almost two years, and I was a newly-minted Motorcycle Safety Foundation accredited instructor. With more excitement than trepidation, I set off on what would be a 6,000 mile fundraiser (over two weeks) for Susan G. Komen. I had prepped for the trip by putting in long weekend days, but those were one-offs, so to speak. How would I do when these long days were daisy-chained? The first day I overslept, under-dressed (I misjudged the weather: it was cold, I needed my electric vest) and discovered that I had failed to pack my motorcycle registration. Not an auspicious beginning! Day One was Bellevue WA to Ashland OR (my very first 500-mile day), and only the early morning was a group ride. I would part ways with the official route in Medford, OR, making most of the ride a solo adventure. I realize that I will soon need my heavier gloves, my non-tinted glasses and a working electric vest… I start looking for an easy-off, easy-on exit. Finally, I think – why not stop at a call box? That’s what they’re there for – emergency-type pull overs. I’m about 10 miles north of Petaluma. Time myself in traffic so I don’t become a hazard and pull off to the far right edge. Those of you who know California roads *probably* know what’s coming next. Turn off the bike and think, “I’m tired. I should put the sidestand down so there’s one less thing I have to think about.” WRONG. The road is seriously cambered – and since I’m tired, it takes me about two beats to realize that once I shift the bike sufficiently to the right to get the sidestand down, I will have passed the point at which I can hold her up under heavy load. S#@!! All I can do is try to slow the fall, onto basically dead grass and some gravel. I stood there looking at a kinda-sorta upside-down bike, fuel leaking out of the gas tank, wondering how I was going to get it upright when a Good Sam stopped. This kind-hearted stranger made sure I could get back on the bike and get it started before he returned to his truck. My friend in Sunnyvale, Jim, used a file to buff the edges of the brake lever, which broke in Sunday’s fall. It’s about 1.30 pm on Monday before I hit the road for Tonopah, NV; day four, I’ll overnight at Bryce Canyon, UT; and day five will take me to Grand Junction, CO. Part of day four’s entertainment was a stint along ET Highway. Days three through five were delightfully uneventful. Day Six. I left Grand Junction about about 7 am on I-70, perhaps one of the most scenic sections of Interstate highway in the country. Sooner than I expected, the road began climbing, temps began dropping. I got cold. Unthinking, I took a polar fleece jacket from one of the small compression sacks appended to my load, removing fully half of its bulk. Back in the saddle, I continue east through Aspen and on to Vail. It’s summer, and a weekday, so it’s highway construction time. Bump and down onto grooved pavement. Bump and back up on asphalt. Wash, rinse, repeat. They pull alongside – windows rolled down – point to the shoulder – and mouth something that looks like “fire”. I do a quick stop and sure enough, the small compression sack has come “unbungeed” up front but remains “tied” at the back – so it “flipped” behind the tourmaster – and obviously touched the pipe. I grab the water bottle from behind the ventura and splash – out goes the fire… I’m untying the mess that remains – half a sweatshirt. I must be in shock because I’m calm and using graveyard type humor. Another guy stops – he’s an EMT … “I have to ask you to please not leave,” he said, “someone on a cell phone called 911 and a firetruck is on its way. It’s not possible to turn it around.” He also tells me that this is on the radio – “motorcycle with saddlebag on fire on I-70.” I’m Thursday morning’s entertainment. We chat; I explain what I’m doing (the breast cancer fundraiser) and he tells me that his mom has breast cancer. After the impromptu party on the I-70 shoulder — an EMT, a firetruck and a state trooper — I inspect the bike. Although it seems fine, the compression sack fire melted the corner of the sack that contained my tent. I decide not to think about this right now (“doing a Scarlett”) and mount up, continuing east. 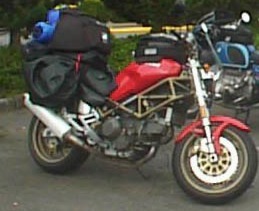 All [of my gear is] now in the line of flowing gasoline (and, in the case of the helmet, also under the bike). I tell the REI guy that I’m having a REALLY bad day. This was the last straw, the #FAIL that sent my confidence into the red zone. But on the lowest day of my trip, in terms of self confidence, I come face-to-face with the reason for the ride. I talk to not one but two men whose mothers both have breast cancer. Randy, the guy who sold me my new helmet? His mom was also a breast cancer survivor. 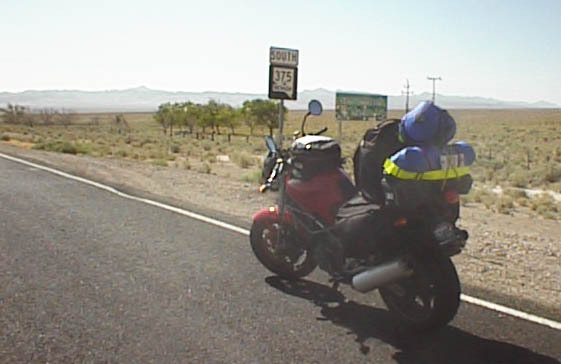 I check the trip meter when I find a motel: at the end of day six, I’ve ridden 2800 miles. The next day, I will be in Omaha, NE, almost halfway across the country, tired but energized by the accomplishment and by the enthusiasm of all the riders I’ll meet there. There are varying degrees of “failure” – some we classify as minor (“mistakes”) and some as major (“failure”). Regardless of severity, there’s usually a lesson. It may be technical (refining a skill) or it may be personal (self-awareness). This trip has both. As I rode from Vail to Denver, I worked backwards to figure out what I did wrong. I was able to see the technical mistake. This was the same process that I went through after dropping the bike on the side of the road in California. Each of these mistakes – failures – was rooted, fundamentally, in my lack of experience. Sometimes we need distance from the failure to reap the lessons. For several years, I saw this trip as a “hero’s journey” sort of thing. That was the extent of my reflection. And then I decided to use the experience in a multimedia storytelling workshop. That’s when I learned the importance of those touch points on what I now fondly call “my riding day from hell.” Had I not “failed” I would not have met these two men, and men are generally afterthoughts when we think of breast cancer. It’s 10 years later, and I still tear up when I read parts of that two-week journal: not the parts where I “failed” but the parts where other people let me touch their lives. I think this is called failure to learn from mistakes! I do not make realistic estimates of how much time and energy a new project might take. I don’t know if this is because I try too many new things or if it’s because I’m not very good at transferring what I have learned across projects. I like to think I’m becoming more self-aware, but I still have a hard time knowing when I have moved into that “mental fatigue” state like the one that led to my mini-fire on I-70. This is a common saying: if you aren’t failing you aren’t trying new things. I firmly believe that this is true. And it’s why I think failure should not be a four-letter word in our culture. However, too often failure is is treated like a four-letter word, something to be avoided in polite company. If you are an employer or manager, and you want the people who work with you to exercise creativity and initiative, then cultivate an atmosphere where it is safe to fail. If you are a parent, cultivate an atmosphere where it is safe for your kids to fail. In that sort of atmosphere, we’ll be less worried about doing things “right” and more focused on doing the right thing. * Too Open To #FAIL?